I'll discuss several summary statistics that are popular for describing the central tendancy of a field. Mean, median and mode are three popular summary statistics. Each of those are appropriate to describe the central tendancy of a field under certain conditions. I'll use an example of meal bill amounts in the tips dataset to elaborate on these three concepts. First off, I like to visualize the distribution of data in a field. 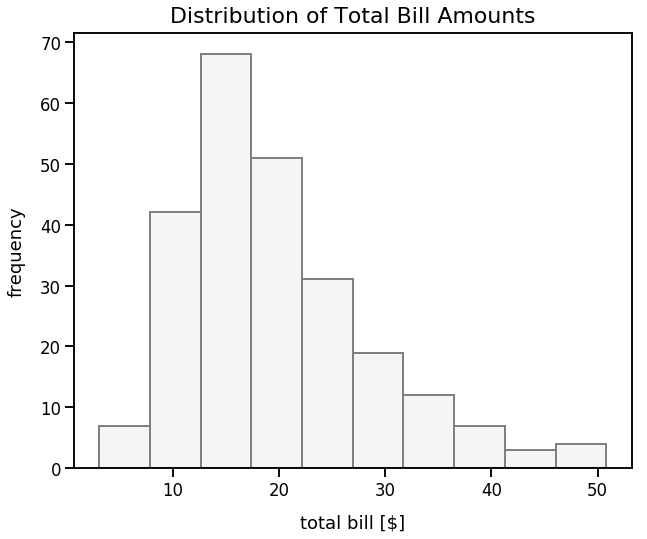 Below is a histogram to illustrate the distribution of values in the total_bill field. The x-axis indicates total bill amounts and the y-axis indicates the frequency (aka count) of occurences of those total bill amounts. From a visual standpoint, it looks like most total bill amounts are around 12 to 20. I can also see a long tail to the right in which there are total bill amounts up to 50. The mode is the most frequently occuring value in a field. We can use the pandas mode() method to calculate the mode of total_bill column in df_tips. We can also query our df_tips DataFrame to see the bills in which the total_bill is equal to 13.42. We're returned three unique meals. The arithmetic mean, also known as the average, is the average of the values in a field. To calculate this: add up all the numbers and divide by how many numbers there are. This is equivalent to the sum of a field divided by the count of numbers in a field. We can use the pandas mean() method to calculate the mean of the total_bill column in df_tips and I'll round this value to two decimal places. Once a set of values are sorted, the median is the middle value. We can use the pandas median() method to calculate the median of the total_bill column in df_tips. The mean of these two numbers is \(4\) and that's our median. 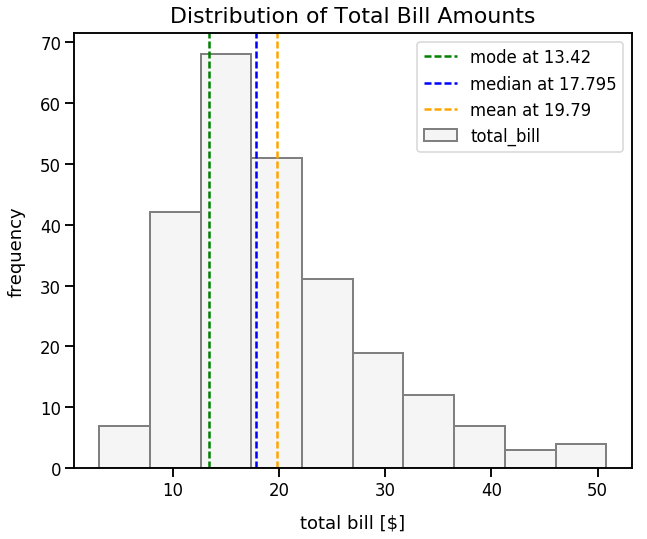 We can now visually see that the long tail of large total bill values causes our mean to be the greatest of the three summary statistics to describe central tendancy. The mode can be flawed for describing the central tendancy of a field because it ignores a lot of data. In our total_bill field, the majority of values seem to be above 18 yet our mode is much lower at just 13.42. Hypothetically, if we had a record of four meals with a total bill size of 30, that would be our mode. However, a value of 30 would seem far off from the what we visually can see as the "center" of the data. The mean is typically the most common summary statistic for the "center" of a set of values. The mean works well if the data is normally distributed. Otherwise, if there's just a few values in a field that are incredibly small or large (often called outliers), then our mean can be distorted. Hypothetically, if in one day four meals had total bill values of 15, 20, 25 and 60, our mean would be 40; yet a value of 40 would be much higher than the majority of our values since it's far larger than 15, 20 and 25. So, in this instance, the mean would be a poor measure to describe the "center" of the data. The median is typically a good measurement to describe the "center" of a set of values. An advantage of the median is that it's less biased when working with skewed data. For example, to continue on the simple example above, if in one day four meals had total bill values of 15, 20, 25 and 60, our mean would be 40; this number seems very far off from the "center" of the values. The mean calculation is heavily skewed by this large value of 60. However, the median of these four values is 22.5 (halfway between 20 and 25) which seems closer to the "center" of the data and is less biased than the mean. 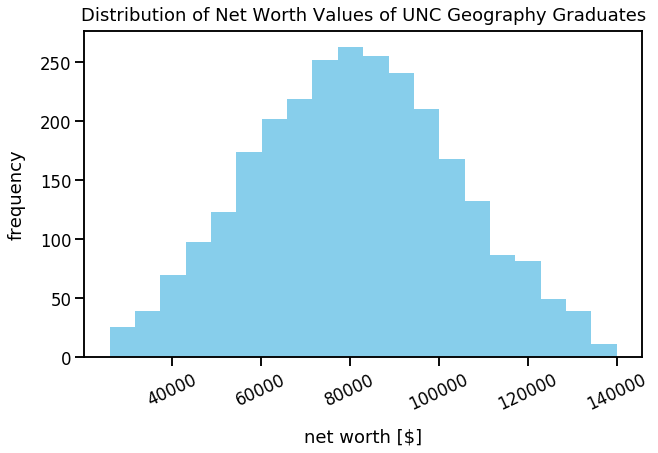 This is a fictional dataset that includes the net worth values of geography graduates from the last 20 years at the University of North Carolina at Chapel Hill. We'll illustrate the central tendancy of these net worth values. First, I'll generate this random data using numpy's random module and normal() method and assign it to the DataFrame df_net_worth. Preview the first few rows of df_net_worth. Let's examine common percentile values. We'll use the quantile() Series method in pandas. It seems our 55th percentile is a value of 80,707 and values are typically within 24,000 and 140,000. 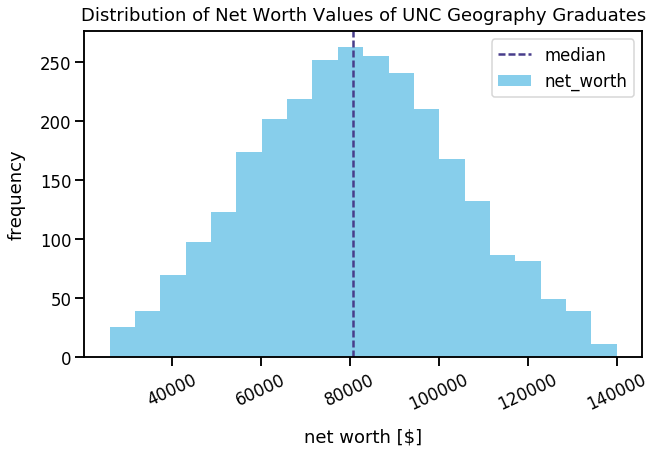 We can visualize our net worth values in this range of 26,000 to 14,000. The visualization below shows a fairly normal distributon and I'd figure the "center" of our data is around 80,000. This value of 687,757 seems way higher than the 80,000 we expected. Why is that? Well, the famous NBA basketball player Michael Jordan also attended UNC and graduated with a degree in Geography. He has a net worth of 1.7B. His super high net worth skews the mean to be a very high number. Let's calculate the median value of the net_worth column below. The median is 80,708 which which seems like a far more reasonable metric to describe the "center" of the data. Let's plot this median on our histogram so we can better see how it represents the "center" of the data.